I’ve been manipulating audio since I was a kid, so when I got into Apple’s iOS and realized just how much potential lies in this platform the search for a good audio editing app started immediately. I’ve been familiar with NCH software on the desktop for some time now. Their WavePad software (confirm platforms) is feature-rich, but those features aren’t hidden beneath layer upon layer of menus or tool boxes. This is a simple and effective. Recently I came across NCH’s Pocket WavePad app, and decided I had to give it a try, a decision made even more compelling by the app being free. Considering the desktop version of WavePad costs from $70 to $140 reading the description on the iTunes app store made the price (or lack thereof) sound too good to be true. All the alternatives I had looked up were either very expensive or completely devoid of any editing tools, so Pocket WavePad went straight to my iDevices. Once I had installed the PocketWavePad iPhone app on my iPhone 3G I learned two things. The first was that the screen of the iPhone is quite small when it comes to selecting segments of audio in portrait mode, and while NCH have made good use of the pinch-to-zoom feature to zoom in on sections of audio it feels a bit laggy on the 3G. The second thing I found out is that the iPhone 3G has difficulty recording at 44.1kHz. At that sample rate some audio gets lost and while the wave form appears of the screen, there are glaring gaps in the audio akin to a missing tooth in a million dollar smile. Working at a lower sample rate without the audio cutting out is still possible, but if a professional musician wants to use this app they will need a newer device to see it perform to it’s true potential. While I had these issues on my iPhone, I found no such problems when I installed the PocketWavePad app on my iPad, so I Immediately I welcomed the larger screen size and the ability to record at industry standard sample rates. The pixel doubling is obvious around the smaller words and numbers, but not off-putting. The recording and editing screens are still perfectly legible. And I’ve found using Pocket WavePad on the iPad much easier when it comes to select audio to trim and manipulate. The number of effects included in this app was staggering to me, considering the price. What really blew me away though was that they all work really very well! I could definitely compare the quality of the effects to those on the desktop version of WavePad, but I’d rate them higher than most of the audio editing apps I’ve used on any platform. NCH have included all the features I would expect to find on a desktop editor, and while that may not sound like much, it is a big improvement on a lot of the iOS apps I’ve seen. Compression, Gain, Reverb, Fades, and more are included, as well as options to cut and paste audio around the clip You are working on. All the effects included have multiple user-adjustable parameters, as well as presets in case You are new to editing audio, or just aiming for a particular sound. 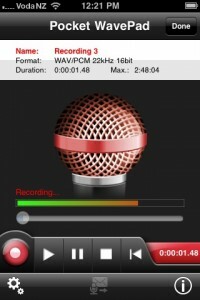 The only limitation of the PocketWavePad software itself that I can see is that the only way to import a file is to record it through a microphone, although this app will support any microphone You connect to your iDevice. What I would like to see implemented is the iTunes file sharing, or some cloud storage integration, like Dropbox, one of cool file sharing iphone apps. Pocket WavePad can currently export your finished files over email and FTP, and they are exported as uncompressed .wav files at 16 bit or 24 bit so You can get your finished clips out of the app to use somewhere else, just not very easily. 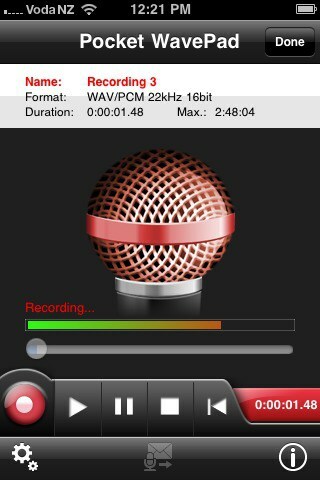 Overall I am very happy with Pocket WavePad app for iPhone. The interface is very sensible, tactile and intuitive, the effects are top notch, and the audio quality is stunning. Before You go spending $9.99 on an audio editing app, You would be doing Yourself a disservice if You didn’t check out Pocket WavePad first.